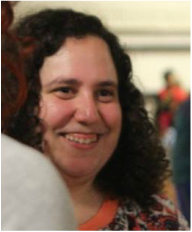 Rabbi Michelle Greenfield is excited to join the team at Kol Tzedek. She is a 2012 graduate of the Reconstructionist Rabbinical College who has experience sharing Jewish education in many settings including classrooms, synagogues, camps, coffee shops, and nursing homes. Michelle previously served as the Shul School director at Kehilat HaNahar in New Hope. Michelle also brings ten years of special education experience and is committed to making Jewish education accessible to everyone. She is exctited to share her creativity and love for Torah with the Kol Tzedek community. Michelle believes in the power of community and personal relationships. She works as a chaplain for Jewish Family and Children's Services visiting personal care homes, and leads groups for adults with disabilities at Mishkan Shalom in Roxborough. She is also a consultant for the Whole Community Inclusion program at Jewish Learning Venture. She spends her free time at the community garden, knitting, playing board games, and learning Torah. ​Contact Michelle with questions about Torah School: torahschooldirector@kol-tzedek.org or (267) 629-2349.